Nothing can make our long New England winters shorter, but flower shows can make waiting for Spring a bit easier. The northeast season starts with the Connecticut show at the end of February. This show has four full days of excellent seminars; it’s always a challenge to decide what day to attend because the speakers are so good. Begonia vendors included the Violet Barn, Snug Harbor and Balleck’s. This show had the best selection of begonias for sale. 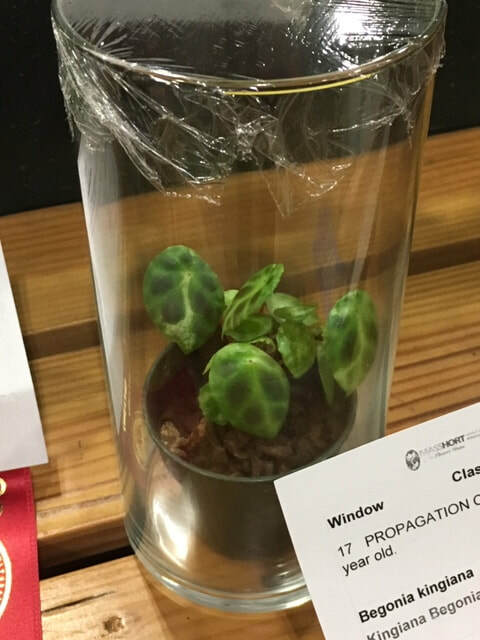 The Garden Federation judged-show featured about 10 begonia entries, some well-grown and some not. 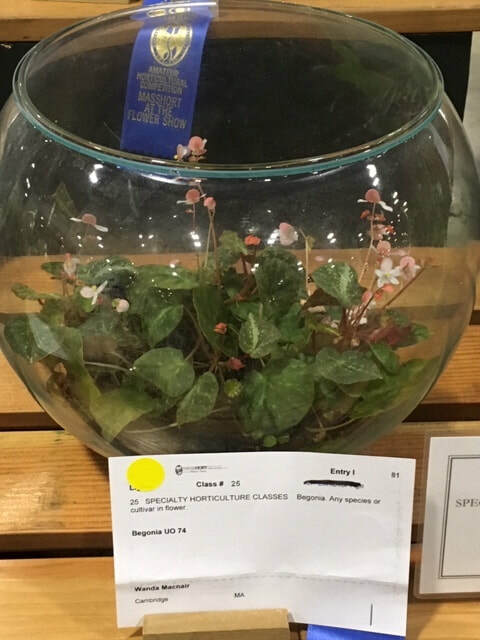 The top prize-winning begonia, a well grown lovely plant was mislabeled! In early March, the country’s biggest and best flower show takes place over 10 days in Philadelphia. Upon entering the show, very large commercial displays interpret the show theme. This year was the 50th year celebration of “Flower Power”. Many smaller displays show an amazing diversity of horticultural interests. The amateur horticulture competition features 700 classes; plants move in and out over the 10 days with judging on three separate days. 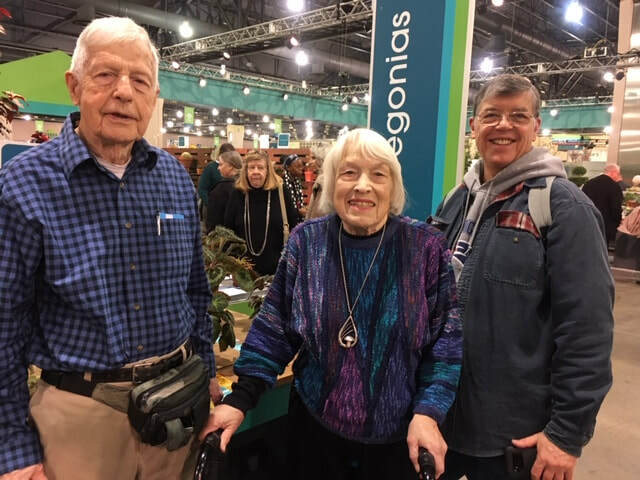 On the second day of judging Richard Elwell and Buxton members Betsy Szymczak and Johanna Zinn judged over 100 begonias. In the past, several vendors provided an excellent collection of begonias for sale, that was not the case this year. The selection and quality of plants for sale was disappointing. The Boston Flower Show is bigger than Connecticut and smaller than Philly. This year the professional landscape displays were the best in many years. Only one vendor, Jordan’s Jungle, had begonias for sale. 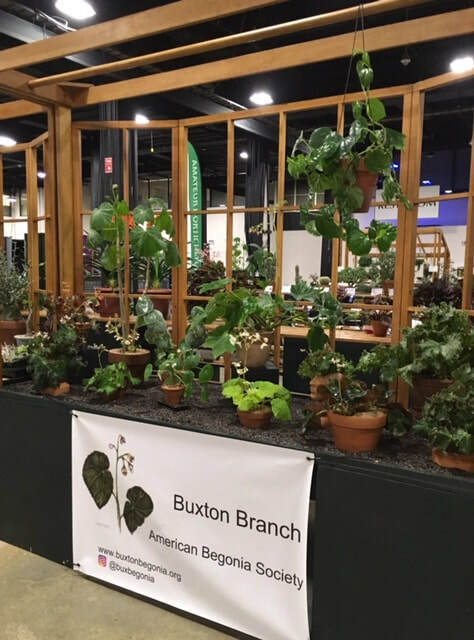 For the first time in 5 years, Buxton entered an exhibit in the Amateur Horticulture Competition. 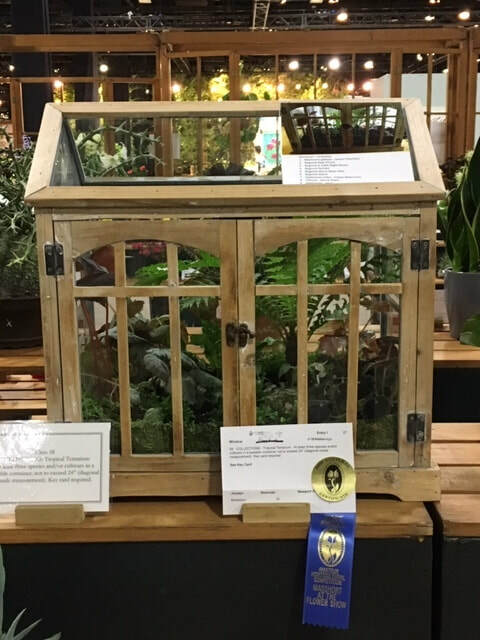 Our display featured 13 member-grown plants, staged in an east-facing window. Julie Hagan, Himanshu and Betsy Szymczak contributed plants; Phyllis and Pat Savage were instrumental in setup, staging and breakdown. The exhibit was awarded a blue ribbon. 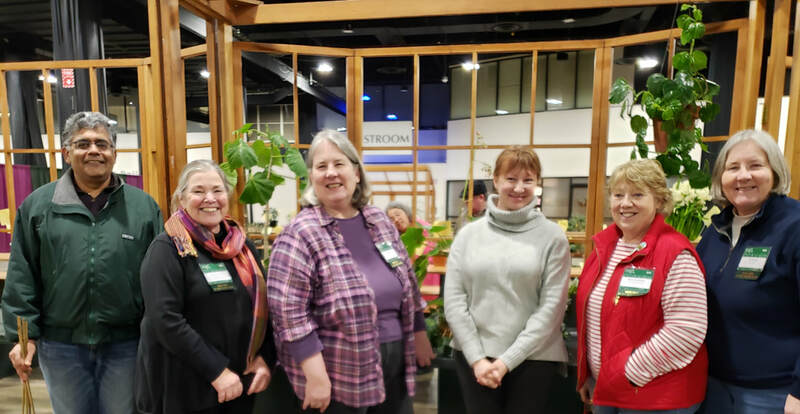 Buxton members served as docents throughout the week; Tony Pinto, Cindy Brown, Helen Cohen Wendy Fearing and Emily Carone answered questions about begonias and promoted our fall show. 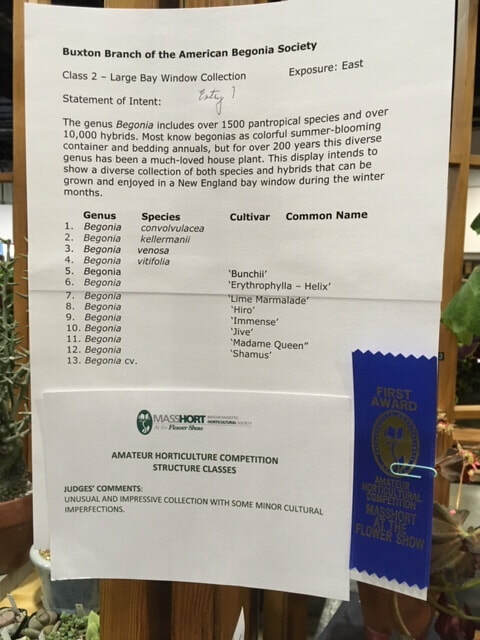 Buxton members, Wanda Macnair, Tony Pinto and Jocelyn Sherman also entered the Amateur Horticulture Competition and were blue ribbon-winners. Wanda Macnair's Blue Ribbon Begonia U074 at the Boston Flower Show. Tony Pinto's Blue Ribbon winner, Begonia kingiana, at the Boston Flower Show.